Once more, we look at a few ways to shoot a magnet across a room. This isn’t a thing we recommend doing with magnets – it’s not their primary use! Looking at it a little more closely, we hope to learn something new about magnets. We’re going to make a few of these contraptions, show the results, and try to figure out what’s going on. This picture (source) depicts how electromagnets switching on at the right time can attract and propel a steel projectile. First, let’s say what we’re NOT making: We’re not making a coil gun. A coil gun consists of a series of electromagnets wrapped around a tube. By switching them on and off at just the right time, the electromagnets can attract a steel projectile, accelerating it down the tube. It’s a really neat project, made with electromagnets and some electronics wizardry. This site is one of our favorite, in-depth descriptions of how you could make a coil gun. It goes into great detail with theory, analysis and some examples of some that were actually built. This picture (source) shows a schematic-like view of how a rail gun works. A rail gun uses the same idea, but with different construction. Instead of coils of wire with electricity running through them, it uses two rails along the length of the barrel. A steel projectile connects the two rails, producing magnetic forces that propel it down the barrel. This results in insanely high currents, but can propel the projectile fast enough to make a nasty weapon. This video is a short news clip about the US Navy's work on rail guns for future shipboard weapons. We’re also not making a “Gauss Gun.” That’s a name commonly given to a series of magnets and steel balls, which shoots a steel ball off the end. We’ve already made one! See our earlier Gauss Guns article. What we’re after is something we’ve seen in a few places, especially in YouTube videos. 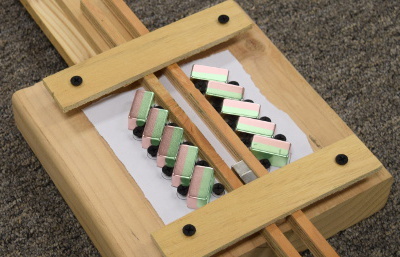 A series of magnets is arranged on either side of a wood rail. 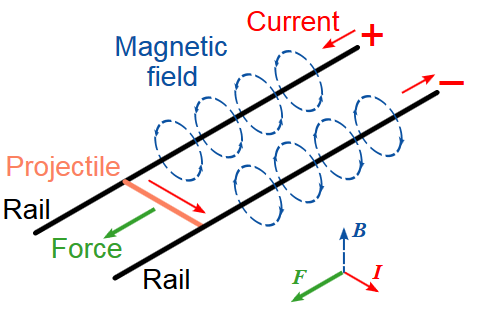 A smaller magnet is placed between them, and is somehow propelled down the rail at high speed. It looks like a cool demonstration, but what’s going on here? How does it work? How can we replicate this setup? Do the magnets need to be angled like that? What other configurations are equivalent? Where does the energy to push the magnet come from? We hope to answer all these questions and more. The magnet cannon we constructed using angled BX088-N52 blocks on either side of the "barrel." Let's take a closer look at what's going on here. 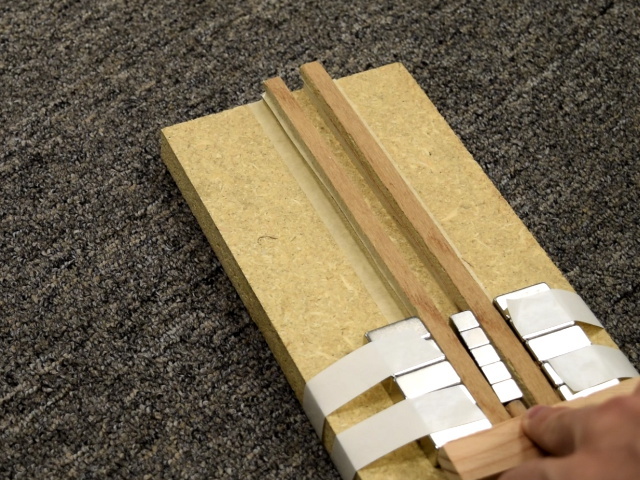 A row of angled block magnets is arranged on either side of a wooden slot. They are set so that all the north poles are facing downrange, down the barrel. The projectile is a series of four or five B666 or B666-N52 block magnets, also arranged with the north pole facing down the barrel. We could also use a single, long cylinder magnet. In our experiments, it shot well with either projectile. When the projectile is placed in the barrel from behind, it is pulled into a stable position just before the blocks on the sides. It is attracted to this position, and finds its stable resting place there. In the graph below, this stable position is where the force curve crosses the x-axis for the first time. Next, we push the projectile down the barrel. There’s magnetic force resisting this, so it takes some force to keep pushing, slowly sliding the magnet down the barrel. The resisting force rises, and then decreases back to zero. This force is shown as negative numbers on the graph. Once you pass this point of zero force, the magnetic forces start pushing the projectile magnet in the opposite direction. The forces start propelling the projectile down the barrel. It gains speed rapidly, and shoots away! The same idea with the BX088-N52 blocks in simple rows. Why are the blocks angled? We’re not sure. Maybe it’s with some hope of creating some kind of perpetual motion setup. While we didn’t find that, we could shoot magnets even better with the same blocks set straight, in a simple row. Here's the same graph and depiction of forces for this setup below. Since the straight blocks work well, why not surround the barrel with a whole ring? If we consider a cross-sectional slice through the center of a ring magnet, we find the magnetic field looks just like the setup with blocks on either side. The advantage of a ring is that we get even more magnet material surrounding the barrel. We used the plastic coated magnet because it’s a much more durable projectile. We could use plain magnets, but wanted to avoid breaking a lot of magnets when they slam into our steel targets. Brittle neodymium magnets won’t hold up to repeated abuse like this! It's our duty to try this same trick with the biggest magnets we could find. We made a ¾” thick ring magnet by stacking three RZ0X84 magnets together, forming a 3” O.D. x 1-1/2” I.D. x 3/4” thick ring. We secured this to a PVC pipe that was large enough to shoot a DX0C magnet projectile. Is this a source of free energy? No. 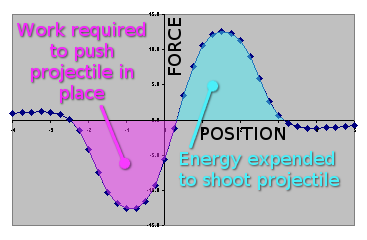 The energy that shoots the projectile magnet out the end is equal to the energy required to push it into position in the first place. As an analogy, think of it like pushing a toy car up a hill. It takes some amount of energy to push the toy car from the bottom of the hill up to the top. When you nudge the car off the top of the hill and it races down, the total energy you get isn't more than what it took to push it up there in the first place. Actually, it will have less energy, because you always lose to things like friction, air resistance, etc. Thermodynamics is a drag. If you want to think about work and energy with this magnetic cannon, the same story applies. Work, or energy, is boiled down to its simplest terms by considering it as a force applied to something across a distance. Imagine a box on the floor. You push on the box with 10 lb of force which slides it 20 feet across the room. You've done work! How much? 10 lb x 20 ft = 200 ft lb. If you like different units, you could say that's about 271 joules, or 0.000075 kilowatt hours. To understand the amount of work done by the magnet cannon, we need to find some measure of force vs. distance. Fortunately, those graphs above show exactly that! Force x distance in this case is the area under the curve. If we measure out the force it takes to push the magnet to the point where it will shoot, we find out that it's the same area as the part that pushes the projectile out. Be careful with powerful magnets!